Moe catches King Toots using his dumpster again. The two characters argue before having an altercation. Moe manages to overpower the gangster and locks him in a tanning bed. Upon noticing King Toot's is closed down, Lisa drags Homer to another music store. In the store a sales clerk manages make Homer think he has something missing in his life. This leads to him purchasing a bass guitar and everything he needs to make a garage band. Everyone is tired of hearing him playing fast, as the sound waves make everything move and fall. A book shelf falls on Millhouse, crushing him. Homer is reluctant to start a garage band as he like sit being just him. He agrees to start one with everyone. Apu joins and everyone is astounded at his vocal abilities. 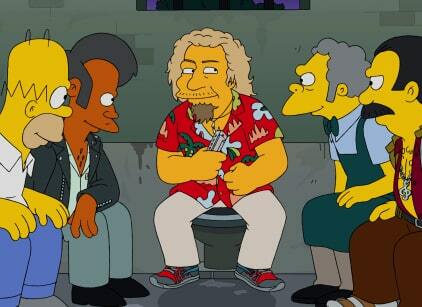 The garage band meet with a band called Sungazer who snap Apu up. Apu becomes a sensation, much to the annoyance of Homer. Homer gets ready to humiliate him, when he finds out that Apu isn't allowed a day off and is being treated terribly. The two get Sungazer back, by feeding them contaminated hot dogs, and Covercraft take it upon themselves to showcase their talen to Sungazer's fans.